This was the first episode to air, in March of 2009, although it wasn’t the first conversation I recorded for the show. I figured there was no better choice for the grand opening than Wooden, who was 98 at the time. Talking with Wooden in his living room. I had talked with Wooden on the telephone several times over the years, and met him once when he accompanied Steve Lavin to Purdue in the early 1990s. So, when the Star wanted to do a story on Wooden as part of its Final Four coverage in 2006, I was asked to visit him at his humble condo in Encino, Calif. I flew out and spent an evening with him. 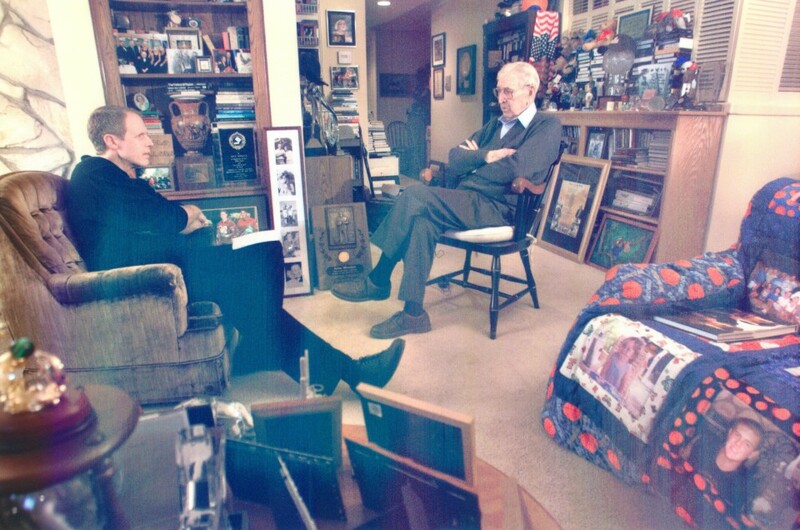 He had a cold, so we sat in his legendary den, filled with all that memorabilia, and talked. He wore a blue bathrobe and slippers over white athletic socks pulled up to his knees. It was one of the most surreal experiences of my life, sitting there with a legendary figure in such a casual setting. The photo here shows my return trip to Wooden’s home, with a Star photograper. It had been three years since I had visited with Wooden when I began One on One, and his health was beginning to slip. He had fallen a year earlier and laid on the floor all night until the athletic trainer UCLA sent over every morning to put him through exercises found him. I wasn’t sure he would be able or willing to do it, but he agreed. I also knew I wanted to talk with him long enough for two episodes if possible, but didn’t want to be greedy. As the conversation progressed, I began feeling uncomfortable for keeping him on the phone for so long. I paused a few times and asked if he wanted to stop, but he always said he was fine. Finally, the guilt overwhelmed me and I let him go. I wish now I’d drained every last second out of him, because this probably was the last extensive interview he conducted. He did one a few months before he died with Rick Reilly for ESPN, but it was brief and he was barely coherent. There were a few details of his life I didn’t explore in enough detail, but we talked long enough for two shows, with inserts from three of his former players: Hoosiers Pete Trgovich and Mike Warren, and Andrew Hill, who wrote a book on the impact Wooden had on his life. Critics might note that I didn’t ask Wooden about Sam Gilbert, who did favors for his players and helped put UCLA on probation in the early Eighties. A lot of people love to bring up Gilbert whenever Wooden’s name comes up, as if Wooden couldn’t have won championships without him. That’s wrong on many levels. I didn’t ask Wooden about Gilbert because time was limited and I thought there were more relevant topics to explore. Maybe I was wrong, but to get into Gilbert would have required another 10 or 15 minutes, and based on my research and conversations I’ve always believed Gilbert’s impact on Wooden’s program has been overblown by some, particularly jealous (former) coaches. I’ve heard one say Lew Alcindor wrote in his book that he went to UCLA as a walk-on, so he could be paid. I’ve read that book, and see nothing in there along those lines. It merits exploration, though. Wooden should have contained it better, but I don’t believe he won games because of Gilbert. His two Indiana recruits, Pete Trgovich and Mike Warren, have told me more than once they received no favors to go to UCLA. And Alcindor/Jabbar claimed he went to UCLA because Wooden didn’t pressure him and seemed genuinely interested in him as a student. That’s definitely in the book. Gilbert did not become involved in any way with Wooden’s program until after UCLA had won its first two championships. Gilbert also was not a UCLA alum, which is relevant regarding NCAA rules at the time. And, recruiting rules were much different in the 1960s than today. I’m not saying Wooden is blameless regarding Gilbert. I am saying Gilbert’s role tends to become exaggerated by many. I’m also saying the majority of successful coaches of major programs have had their own version of Sam Gilbert. Bob Knight included. One of Knight’s players, someone well-known to IU fans, told me he once drove to a city north of Bloomington to pick up a new car. New to him, anyway. It was slightly used, but a really nice car. When he opened the trunk, a set of new golf clubs was inside. I asked him if Knight had set it up. He said he wasn’t sure, but Knight knew he had received the car. Few programs are holier than thou. 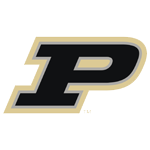 Both of these episodes with Wooden aired four times on the radio: the show’s debut, on his 99th birthday, leading into the airing of the Wooden Tradition in which Purdue was playing and after Wooden’s death in 2010, about four months shy of his 100th birthday. These podcasts consist of the tribute episodes, but the only difference is the intro and closing. Hopefully they’ll still be interesting 100 years from now.